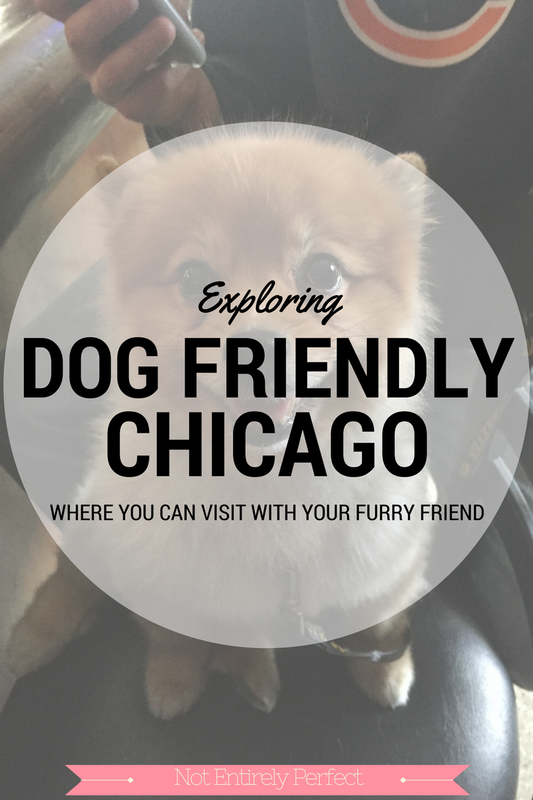 If you have a dog in Chicago, you're probably aware of all the dog specific places you could adventure to. There's the dog beach (HRH Princess Hawkeye and sand? Absolutely not. ), the 606 running trail, and the various dog parks (she likes the Lake Shore East Park the best.) And you can bring your dog if you're dining outside in a restaurant's patio area. But besides those places that are specifically marketed to dogs and dog owners, I wanted to share the places that I take Hawkeye to on a regular basis that you might not have thought of. Dogs are allowed at Navy Pier and, in fact, on some of the sightseeing boats. You know, should your dog like a nice tour of Chicago architecture from a riverboat. You can't bring them into the main structure where the food court and some little shops are, but they can be in all the outside areas and the restaurants like Harry Caray's that have outdoor seating and bar areas allow you to sit with your pup and order. If you're a White Sox fan, they have (at least) 2 days a year where you can bring your dog, so be on the lookout for their Dog Days. You can always take your dog to street fests. Put them in a stroller, they love it. Put booze in the rest of the stroller. Everyone wins. While you can't take your dog to the Bean (Millenium Park), you can go to Grant Park and take some selfies at the Buckingham Fountain. Dogs are allowed on the canoes and kayaks on the Chicago river, but I'm terrified of that toxic water so that's one you definitely won't see us at. But hey, if you're brave. If you want the river without the actually getting in the water, the Riverwalk is totally dog friendly as well. This isn't a hard and fast rule or anything, but generally if a bar doesn't serve food, you can bring your dog in. You can probably predict just from the type of bar if it'll be okay though - trendy clubby places that don't open til 10? Not a dog place, regardless of the lack of food. And if you want to take your dog to somewhere like that in the first place, your dog and I both hate you. No, it's generally the low key 'dive' (they aren't all dives) bars, those casual places that open early for day drinking. Hawkeye loves her some Corner Bar. She's also been a former regular at Clark Street Ale House. And breweries without food are a safe bet as well. Find a pretty extensive list here. A surprising number of stores are dog friendly in this city, and not just pet stores. Just in general Hawkeye makes runs with me to the bank, the cleaners, the liquor store. We're also able to shop at most of the boutique places. A lot of them even have their own dogs there, like RepChi. Chains that allow dogs that aren't specific to Chicago include Nordstroms, Pottery Barn, the Apple store, Crate and Barrel, Macy's, TJ Maxx/Homegoods, GAP, Michaels, Ann Taylor LOFT, Bloomingdales, Urban Outfitters, Barnes and Noble, Anthropologie, Foot Locker, Old Navy, Bed, Bath and Beyond, and even Saks Fifth Avenue. The list is extensive. So there you have it, a reason to bring your dog everywhere! P.S. Small pets in protective carriers are allowed on public transit, in case you're wondering how Hawkeye and I get around without John's truck.